Yesterday was the first cold fall sort of day we had here, to celebrate I figured I would grill up what will probably be the last of the delicious summer melons. 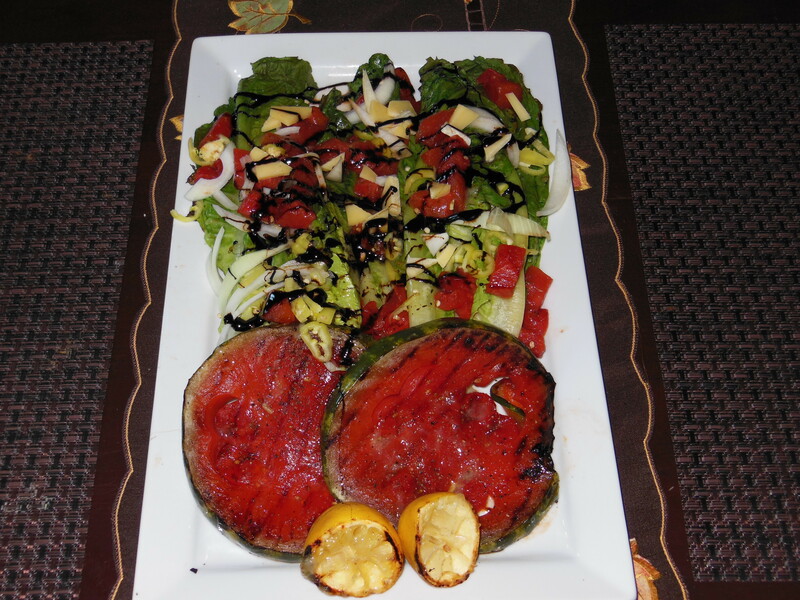 This is more than just grilled watermelon on a salad…I actually grilled the salad too! Neat, huh? 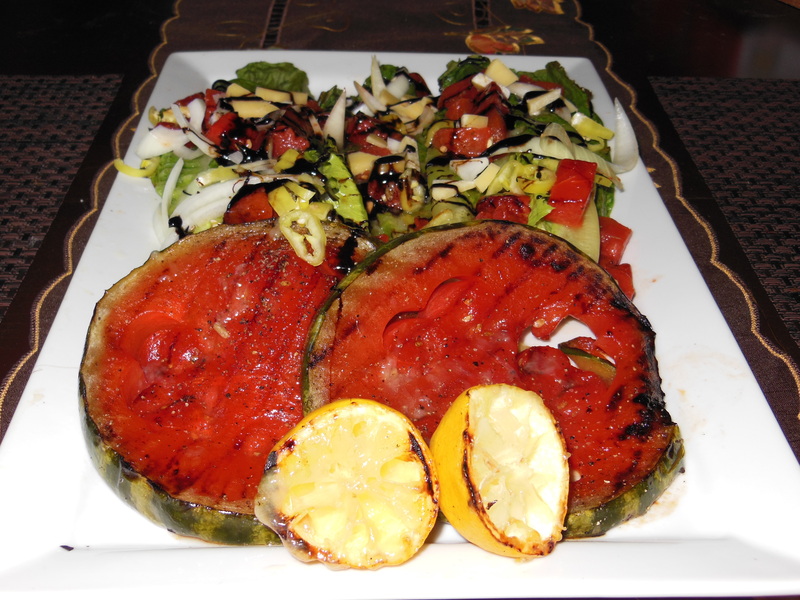 If you have never had grilled watermelon, you absolutely must try it, it doesn’t taste at all like you would expect. It is effing incredible! If you don’t want to use it in a salad make a salsa with some or just eat it as dessert., but you absolutely must try it! Today is also an exciting day for me, its CSA day which means I get a big bag of goodies! Keep checking back to see how I make use of my fall veggies! Quick go start up your coals before you start to make all of this fabulousness. 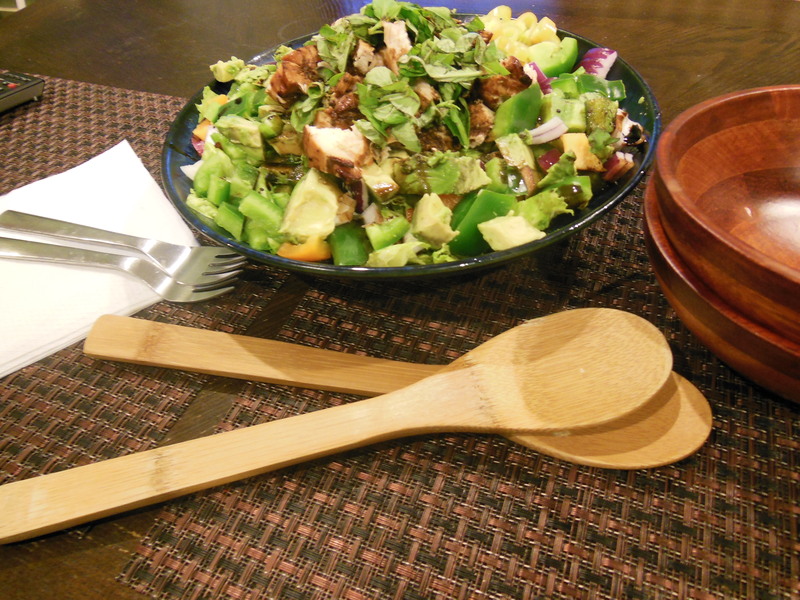 Ok…first of all, I have to clarify what you should an should not use on top of your salad. Who knows, you might make an epic mistake and pick something like a tomato. You really cannot use anything that is to wet or slimy here because it will be just too much of one texture. Pick stuff without a lot of juice like carrots, pepper, or even toasted pine nuts would be great here. Our little princess is in the background! I know I called her a princess but what I really meant to say is demon. 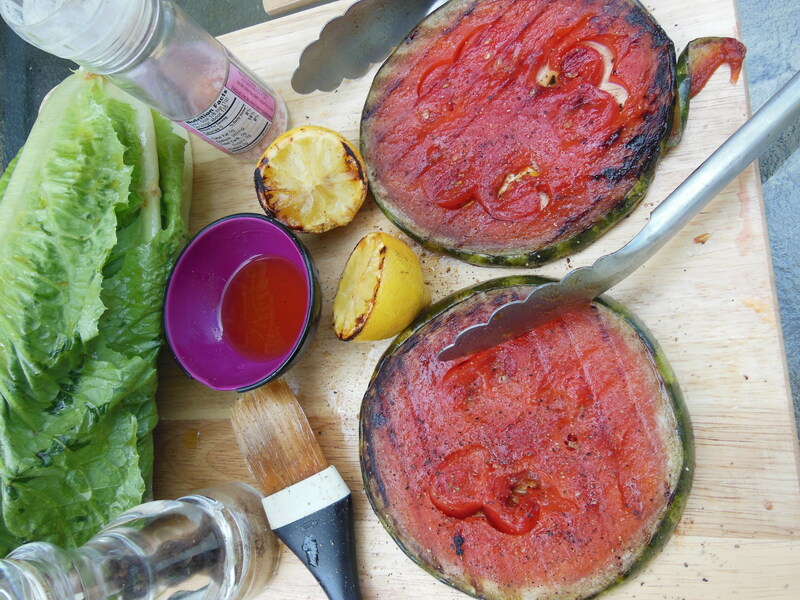 Anyway, slice your melon into large enough pieces to cook on the grill. I left my rind on because it makes them easier to flip. Brush them b*itches with oil and set aside. 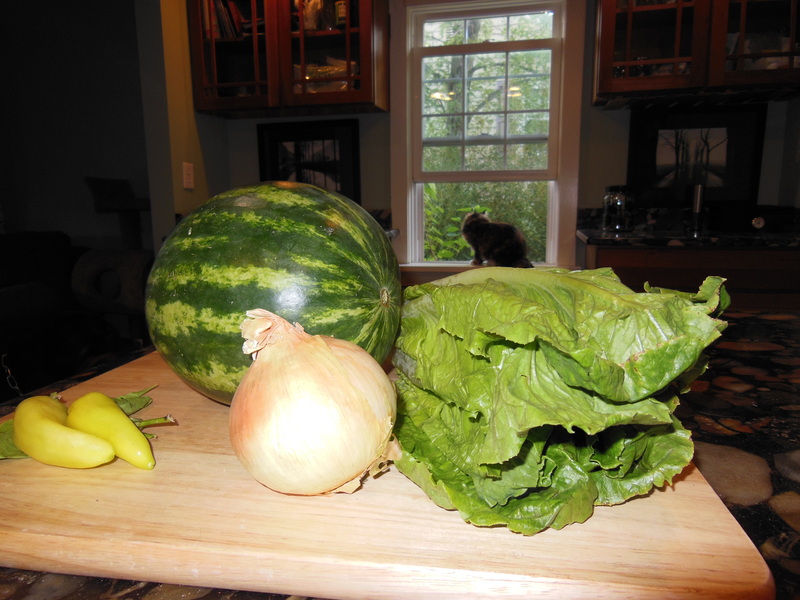 Brush down your whole lettuce head the same way, lob your lemon in half and brush the cut side, then take all that crap outside. I grilled my melon on medium-ish heat for about 20-25 minutes flipping occasionally. When you see nice grill marks you are all done. 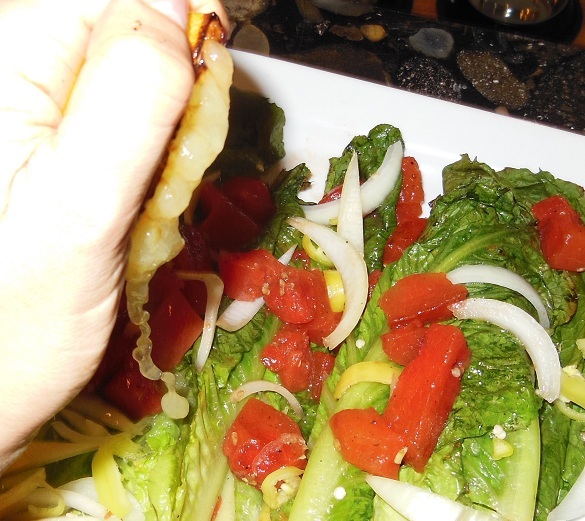 Throw your lettuce and your lemon on there, put the lemon cut side down to bring out the juices. 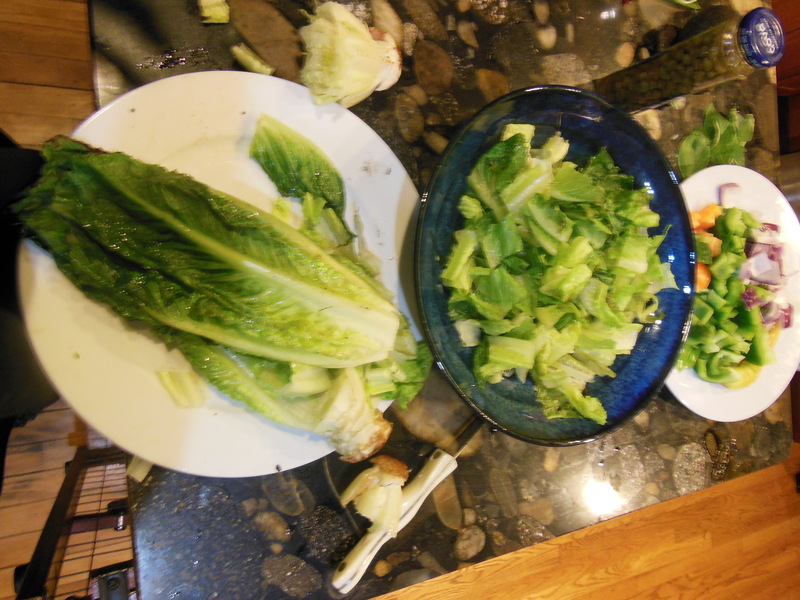 Keep a close eye on your lettuce it will burn very quickly, so turn it often. This is the really cool part. Once you pull your melon off, you salt and pepper it on both sides. Yuck, right? Actually not at all, it makes it taste super meaty. It is like eating a watermelon lollipop flavored meat. 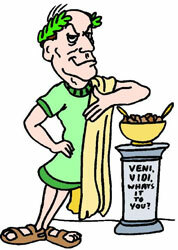 Ok, that really did not help my case any, just eat it! 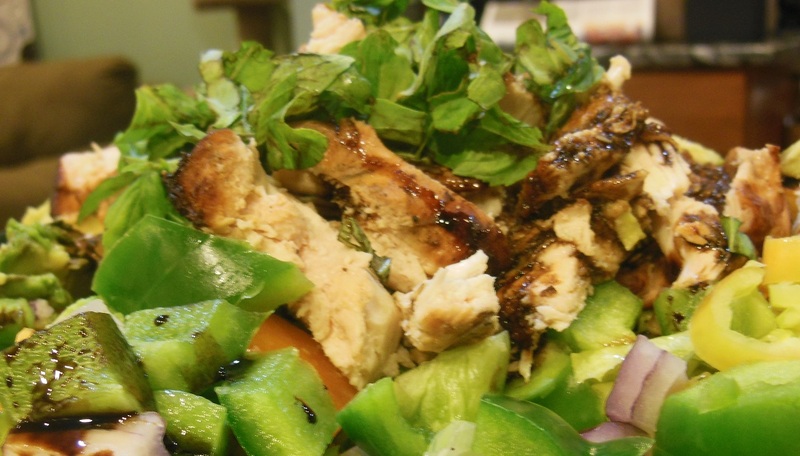 When everything is grilled into a state of deliciousness you can start assembling your salad. Chop the end off your romaine head and cut in half (or whatever), cut your watermelon into chunks and start putting it on a plate. 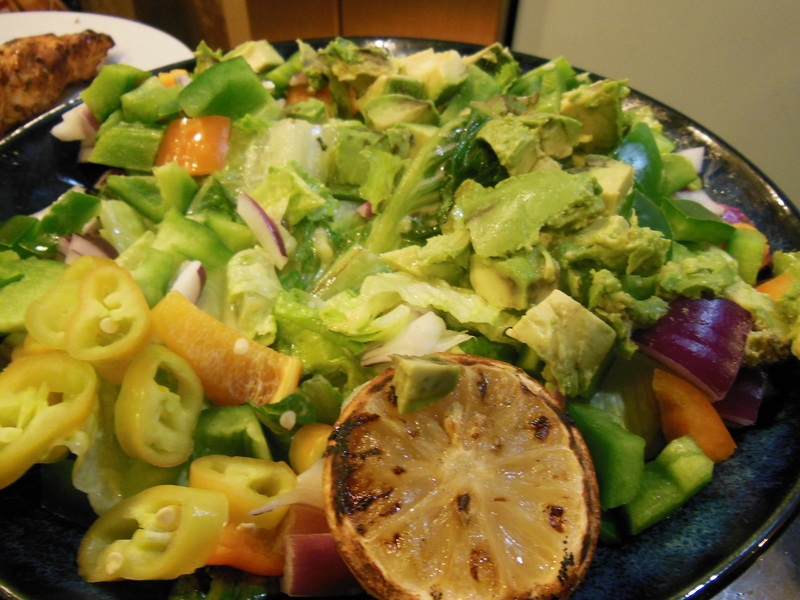 This salad has plenty of juice and oil already cooked into it, so I like to use a bit of lemon juice for dressing. If you were paying attention you should have a nice grilled lemon, all caramelized up already. 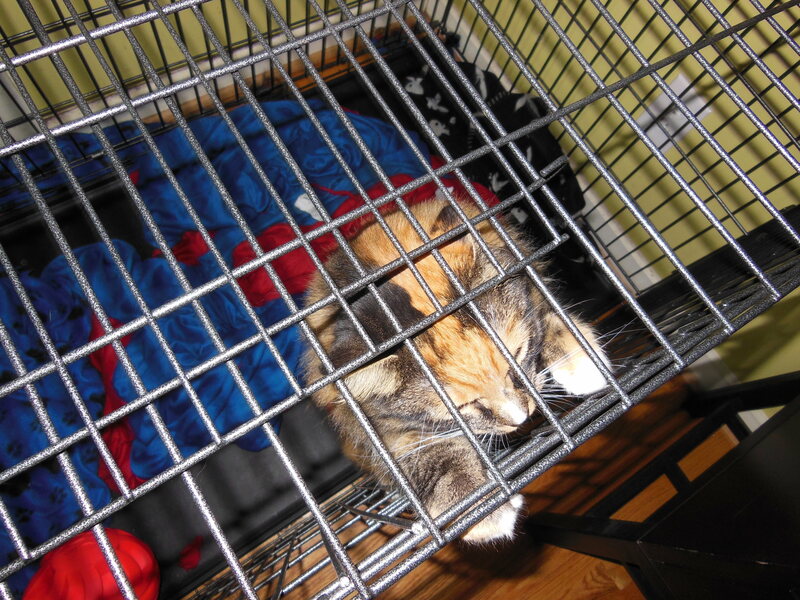 The juice will pour out of this thing like tears after one of those stupid Sarah McLachlan ASPCA commercials. (D*mn you, you night ruining b*itch). 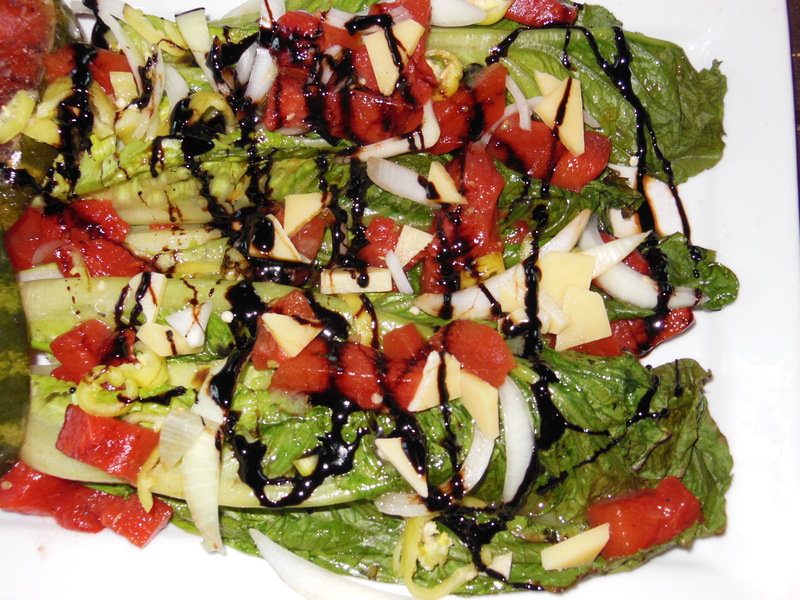 I finished this salad with a balsamic reduction. 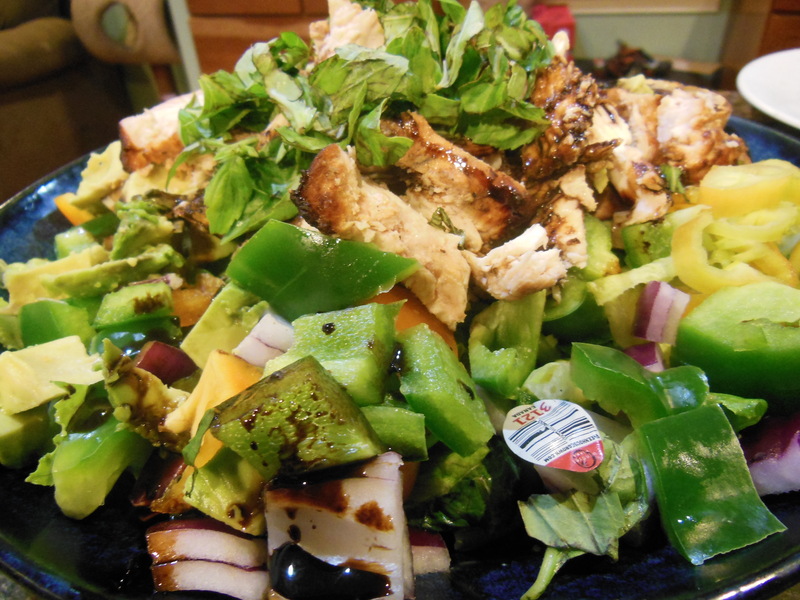 The bestest-most awesome part about a balsamic reduction is that everyone thinks they are super fancy. You basically boil the hell out of something until it is thick and reduced, doesn’t sound so fancy now, huh? Put 3 times more vinegar than you need/want to use in your pan, boil it a ton, when it is reduced to a third of its original volume you are done. Ooohh so complicated! If you want to keep reducing you will end up with a thick syrup that is great for desserts. If you wanted to make a meal out of this I recommend adding some sort of mild white meat; like chicken, cod, mahi mahi, or scallops. Enjoy!